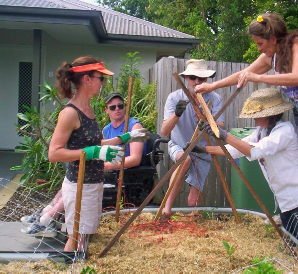 The ‘Our Patch’ Edible Garden program was established as part of the Sunshine Coast Council’s Active, healthy Sunshine Coast Initiative. This is a project funded under the Commonwealth Government’s Healthy Communities Initiative through the Department of Health. The initiative was established to support Local Government Areas in delivering effective community based physical activity and healthy eating programs in targeted localities that support community members most at risk of developing chronic disease to adopt achievable and sustainable healthy lifestyle behaviours. The gardens are built over five workshops under the instruction of Leonie Shanahan, local permaculturalist and founder of ‘Edible School Gardens’, which see residents learn how to plan, design and build the gardens from start to finish. Workshop 1: Temptation Day – discuss garden vision and ideas, plan and design. Cooking class and shared lunch. Workshop 2: Set Up Day – garden layout, construction of garden beds, soil layering technique and health and safety discussion. Workshop 3: Planting – Education on types and use of various edible herbs, fruit and vegetables. Plant various seeds and seedlings and education on best technique and layout. Workshop 4: Compost – Construct a compost bin and education on the do’s and don’ts. Education on how to care for plants, companion planting, and green manure. Cooking class and shared lunch. Workshop 5: Work Farms – Construct a worm farm and education on do’s and don’ts. Hand over project to residents. Cooking class and shared lunch. Residents also take part in a cooking class at three of the workshops, during which they learn how to use the produce they grow in healthy, tasty and nutritious meals. These workshops are delivered by University of the Sunshine Coast Nutrition & Dietetics students, as part of their 6 week Public Health placement. To date, edible gardens have been completed at Beerwah and Landsborough, and residents and staff alike have been amazed at the results. Red ripe tomatoes, crispy cucumbers, squash, juicy melons and pungent herbs are already being enjoyed by all. The gardens have encouraged a sense of ownership and purpose among the residents, have created a space for residents to talk and share ideas, and have given Coast2Bay a positive reason and purpose to engage with residents.